Having spent about half my first two decades of life in various tents, two different Volkswagen bus campers (ah, the 1977 Campmobile! ), and backpacking, I know a thing or two about living in small spaces. There are plenty of tricks and strategies, some of which turn out to be useful in an average sized home (whatever that is) or even large ones. I’ll be illustrating some of these concepts in future articles with my Reset House, a recent extreme design which is ideal for this purpose. Building small is not a new trend. In America following WW II, millions of sub 1,000 square feet homes were made available for GIs that kicked off the baby boom and our current state of sub-urbanity. Frank Lloyd Wright developed the Usonian House as an accessible option for good design, almost as a reaction to his early prairie style mansions. High pressure real estate values in heavily populated city centers have pressured living space sizes for ages. 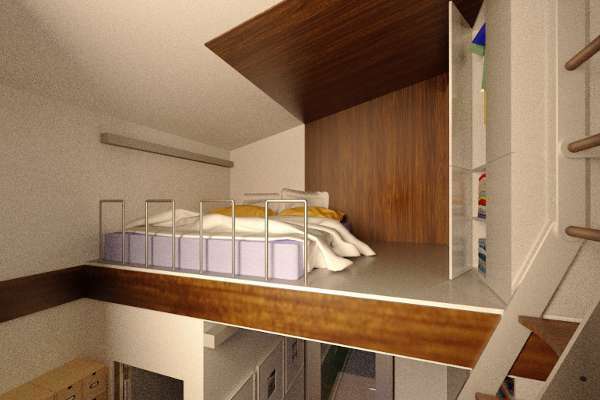 Today, this can be seen in micro-hotels in Japan and fold away apartments in New York. But financial economics are no longer the only argument for small. As discussed in my premier article for this blog, Better than Bigger, these recent reconsiderations of how to live better have begun a sea change in how homes are designed. Strategies for more thoughtfully arranged spaces that are beautiful, comfortable, useful, and more efficient is afforded by good design, not size. 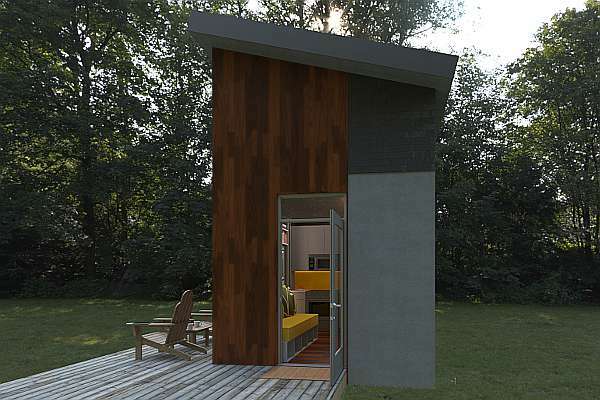 The Reset House is inspired by this reconsideration in a 120 square foot luxury micro-home for a family of four. 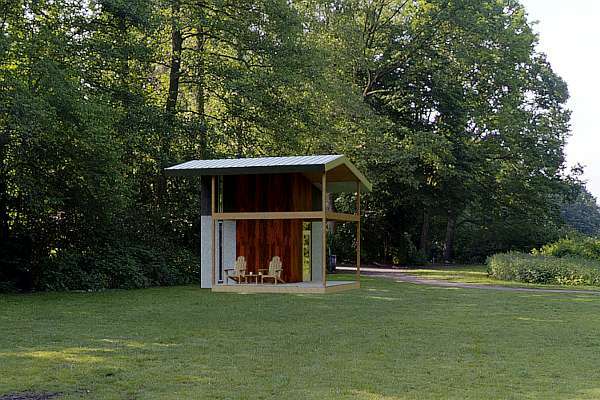 It potentially begins as a simple shelter with about $800 worth of materials. Continuing improvements grow it by phases into a simple enclosure, then a weathertight three-season apartment, to a fully livable home, and finally a posh pad for a teenager in the back yard, a vacation cabin, or even a short term house for a family. Over a series of articles I’ll explore the Reset House’s space saving design features. We’ll talk about potential phasing from deck to luxury guest home. I will also discuss some of the technical interests in construction, energy performance, and feasibility options. The compact form also sharpens priorities for the kitchen design, not all of which made the cut. This will all be relative to the house’s Dream, the priorities determined before the beginning of design that resulted in this particular set of options instead of many others that could have easily resulted. I’ve realized that the advantage of using this small encapsulation of a home is how well it explains so many design concepts. With less to consider, each issue’s significance and interrelation is clearer. Instead of elaborating on the larger set of possibilities within a typical home, these conversations will highlight the integrated nature of design and the back and forth development in architecture. Continue to follow the articles here in the category Reset House. Or stay tuned by subscribing to the monthly newsletter. This entry was posted in Better, Reset House on 2013-12-18 by Steve Hall. 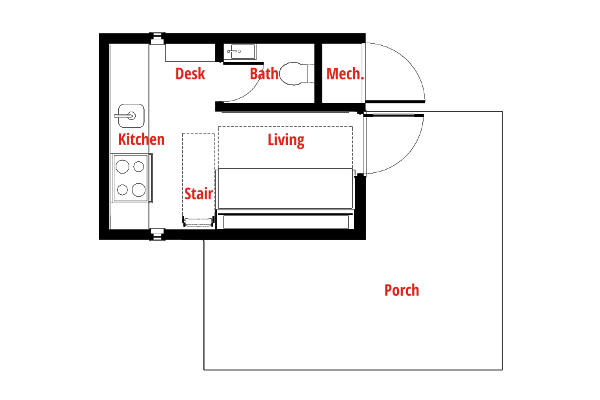 As presented in the Reset House introduction, this micro-house ideally illustrates complexities in planning and draws our attention to meaningful design considerations. When space is at a premium, hard decisions must be made and priorities outweigh other conveniences and luxuries. Often called tiny, small, little, micro, cottage, nano, or compact, these homes typically share one common strategy to make more space. A logical conclusion when designing a 120 square foot home for four is that exterior space is a great method to extend living space. I still distinctly recall the enormous canopy my father installed on the side of our 1977 Volkswagen Campmobile because it literally doubled the amount of sheltered living space we had. The same applies here on the Reset House. The covered exterior porch is a larger room than any indoors, even though it is not a small expense for permanent, code-complying construction. There are other strategies to make living better. 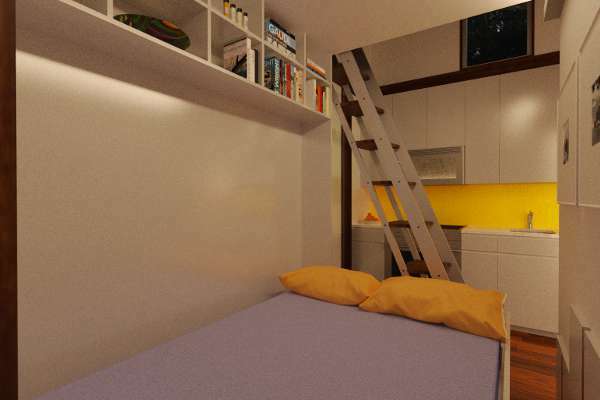 The interior finishes are beautiful, energetic, and cheerful. Natural wood is used throughout and a warm golden yellow is balanced by a soft blue. (Technically, this is a primary scheme because the wood is actually a shade of red.) There is plenty of cove and soffit lighting bounced off the yellow backsplash and the ceiling to avoid harsh glare. The majority of the remaining exposed surfaces are white, either painted or a glossy plastic laminate to endure hard use and splash more light around the spaces. The spacial design centers on a strategy of double-loaded circulation. This is a circulation spine with spaces on both sides. Here, the entry door is in the middle of the home with the short path to the kitchen dividing the seat and the bathroom. The same ordering system continues upstairs with the bed on one side and a long storage wall on the other. By double-loading it, the circulation total is reduced and shortens access to everything else. Which means more usable space within the total. 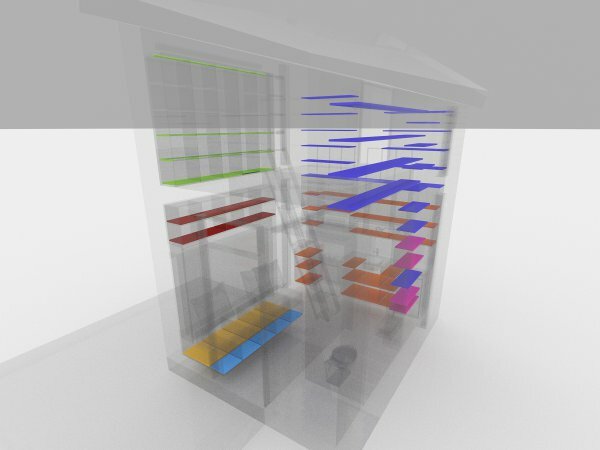 The loft upstairs accomplishes more space savings than any other feature. 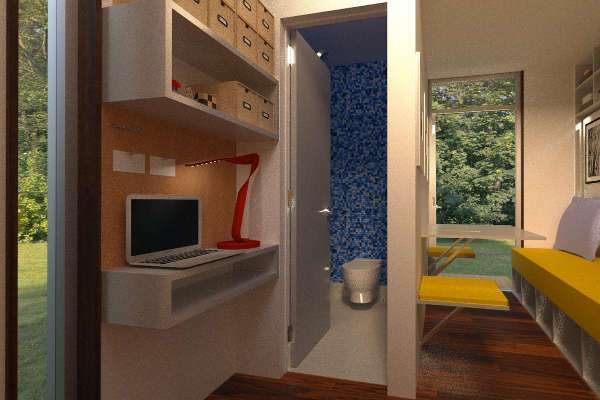 It doesn’t count in the 120 SF footprint, but it could be extended to almost double the available living space. Technically the building code does not count spaces less than 7′-0″ high, and real estate agents, appraisers, and mortgage lenders do not count anything less than 5′-0″ high. (Odd that those two aren’t coordinated, isn’t it?) But it certainly is usable. The loft in our van was the most spacious of anything else. So, too, here in the Reset House. Even the simple shed roof contributes to the scheme. It is the most efficient form structurally but it also has the advantage of enabling higher headroom at the ladder and the storage cabinet wall. Continue to follow the articles here in the category Reset House. Next article, I’ll talk about my favorite strategy that Reset uses to increase usable space. This entry was posted in Better, Reset House on 2013-12-19 by Steve Hall. This third part of the Reset House series introduces another space-saving strategy that buildings have employed since the classical era. The previous article on making space presented three architectural methods for creating more space. Now we’ll explore how one space can serve multiple uses. 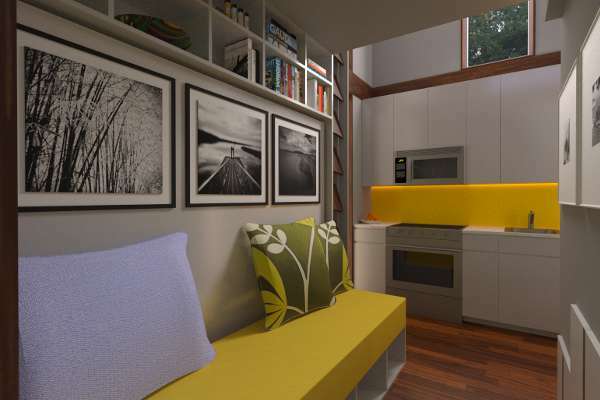 A creative feature of the Reset House is its fold-away furniture, beginning with the Murphy bed. This is an ingenious early twentieth century invention that allows a bed to fold up against a wall to clear the floor beneath for additional habits of living. In this case, it doubles as a bench seat or futon. The word doubles is intentional—it highlights another effective increase of space for living within the same floor area. Have a “Better” feature you think would improve the Reset House? Contact me and pass it along! The only rule is that it can’t increase Reset’s square footage. In the concluding article of the series, I’ll model and feature up to three of the best suggestions. This concept is key to increasing usefulness. Intuitively, we know that many spaces serve more than one purpose. Sometimes, this is intentional, but often it is through the looseness of life (called clutter). But spaces can be ordered purposefully with multiple functions sharing part or all of the same volume. Furniture, screens, folding panels, and drawers adapt the space for its different purposes. Practically, these overlaps may double or triple effective use, although it is feasible for just one space to flex dynamically for all purposes1. The Reset House has a loft to accommodate more sleeping and storage, but beyond this, there is only one other distinctly separate space in the bathroom. From the Roman Baths of Caracalla in AD 212 to churches today2, overlapping building purposes and high clerestories have been used to unify different spaces and bring in natural light. But it was modernist architects like Sullivan and Wright, Loos, Mies, and Le Corbusier that realized interconnected spaces in the design of houses. Wright is particularly notable in this regard for using both horizontal and vertically unifying volumes. Today, two story entries, living spaces, and open plans are expected3 and are directly derived out of this overlapping concept. The Reset House collects nearly all the living functions together in overlapping uses to make the most of its tiny area. The high window for the loft brings natural light down to the living level and creates an expansive view far beyond the enclosure. While fold-away furniture certainly increases potential functionality, it must be well designed to minimize the impact of adjusting from one configuration to the other. The design in each state must also be resolved. For example, the photographic art over the seat is simply mounted to the underside of the Murphy bed to be visible when folded up. Fold away beds also create a bit of ease in making them up in the morning, too. The ladder stair is exactly that: a combination stair and a ladder. The stair slope is identical to smaller step stools found in home stores, with the stringers larger to carry the longer span and serve as a bit of handhold. While more steep than a typical stair, it provides considerably more comfort than a true ladder to the loft despite the added expense. There is a true ladder portion on the wall above to continue handholds to the top step. The whole thing folds out of the way to hang on the wall during the day. The dining table and two chairs, one on either side (will be clearer in the next article) fold up against the wall and down as needed. In this design these simply hang on the wall, but added with more sophisticated detailing they could fold into it, inset and flush for minimal obstruction. To continue this overlapping strategy, the table is shared by the bench seat so four people can sit together. Continue to follow the articles here and reference the tag category Reset House to see the collection. 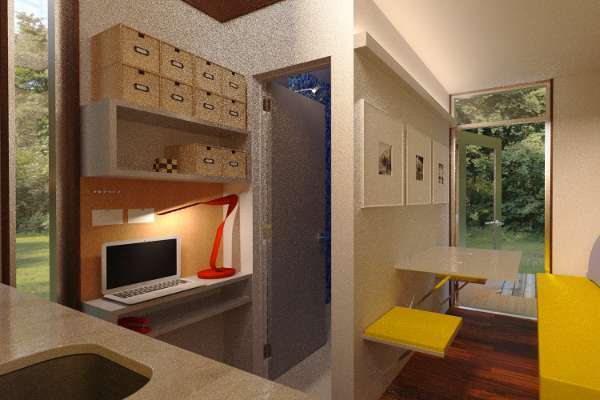 The next article will look at storage, the “office,” and the bathroom. The excellent PBS e2 series highlights Werner Sobek’s R129 house in a way that I haven’t found anywhere online. His concept is a small singular bubble with moving furniture rising out of the floor to adapt the space to every function of the house on demand. In some future article I’d like to expand this history of overlapping spaces. The Baths of Caracalla and the spectacular Basilica of Constantine in Trier (AD 310) were precursors to the cathedrals, palazzos, and churches today in profound ways. According to the NAHB Top 10 Features For Upscale Homes, published July 1, 2013, although numerous other surveys confirm. This entry was posted in Better, Reset House on 2013-12-26 by Steve Hall. 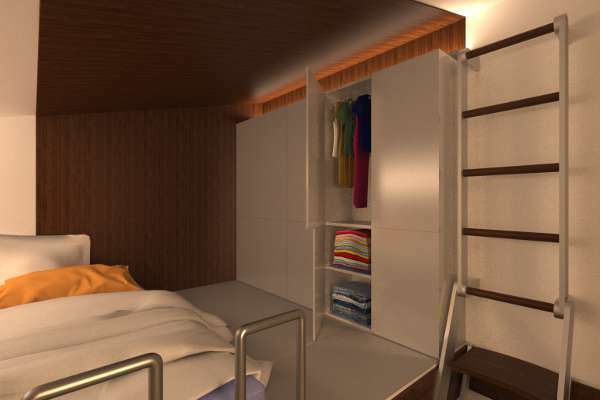 The demand for storage is the same in the Reset House as any residence larger than 120 square feet. Some may want more and others want to avoid too much. There is at least consensus that it should be usefully configured. There are several good strategies to make storage better, but we need to quantify it first. Capacity can be measured two ways: length and volume. In the first measure, the linear feet (LF) of shelves, drawers, and clothes rods are totaled for a usable length. This method assumes that all other important variables are appropriate for the items being stored. So a foot of knife drawer and a foot of coat closet count the same because both appropriately store a foot of their intended contents. This can become a problem after years without adjustment. Rebalancing the large and small spaces across a home will correct storage proportions with surprisingly more capability. The other measurement is by volume, where the total (length) x (width) x (height) is calculated in cubic feet (CF) for a three-dimensional total. This method is useful for a full re-organization where types and scales of storage are adjusted. One may be exchanged for another. Kitchens especially benefit from this type of reconfiguration. For example, a series of shallow and customized drawers with more specific compartments for things like utensils and knives may double the useful quantity of kitchen capacity over standard drawers and doors. The Reset House as shown has 106 LF and 113 CF of storage. The diagram above illustrates the different types by color: kitchen ( orange ), clothing ( green ), book shelves ( red ), shoes and tools ( blue ), seasonal or long term ( yellow ), and office ( magenta ). With additional spaces also used for storage ( royal ) in the diagrams below, the Reset House could grow to include 192 LF and 201 CF of storage! This is possible by encroaching onto the architecturally open feel of the Reset House. While this would increase storage about 80%, it certainly decreases the remaining volume for living. Every homeowner has different taste for this balance between livable openness and storage. Better storage is centered on accessibility. Intuitively we know to place rarely used items in the hardest to reach or least forgiving places. Holiday decorations in the attic is a common theme. With more frequently used storage areas, this basic intuition can be better informed with further layers of organization. For example, in a kitchen, large or seldom used pots should be stored very low or high depending on their weight. Daily use silverware, sauce pans, and cooking utensils obviously belong nearer the middle counter height. Specific arrangement around the plan is developed through personal preferences that need to be analyzed before understanding where to place storage and how to configure it. Some kitchen users prefer working at stations, some in the traditional refrigerator-sink-range triangle, and others in a compact work zone. Obviously, the preferences of the chef dictate the configuration of the kitchen! It is the same with the remainder of a home’s storage. Items will be classified in one or multiple categories according to their intended use: seasonal, outdoor, fragile, display, workspace, cooking, entertainment, bills, files, electronics charging, interests and hobbies, tools, guests, clothing, bedding, bath, hygiene, and so on. Go to any department, housewares, home improvement, electronics, or grocery store and observe the aisle and section names as indicators for potential arrangements and systems for all of a home’s storage. 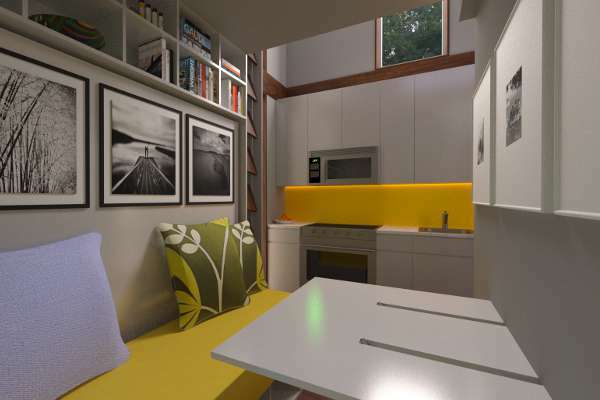 In the Reset House, large but less accessible spaces are provided hidden beneath the seat cushion ( yellow ) for seasonal or less frequently used items. No space is wasted and any place hidden become storage. Including the additional potential storage areas ( blue ), you can imagine the potential configurations Reset could accommodate. Continue to follow the articles here and reference the tag category Reset House to see the collection. The next article will look at the “office” and the bathroom. This entry was posted in Reset House on 2014-01-04 by Steve Hall. This is the fifth article on the Reset House, a series on better home design illustrated in just 120 square feet. It’s no secret that the mobile office is here to stay. Working from a phone, tablet, or laptop from anywhere in the world is as common today as having an actual desk in a physical workspace. So the Reset House provides only a small space dedicated to work and focus. Certainly the porch would be more welcome on a fair weather day. But in the interest of providing at least a little touchdown space beyond the table, a shelf is defined. More important than the size of the worktop is the amount of potential storage area around it. As discussed in the previous article on storage, areas for keeping physical belongings surround the space, including a bulletin board and staging areas for bills, mail, stamps, memorabilia, and files. Now we come to the largest sacrifice that had to be made in the home as a result of its tiny size: the single space bathroom. A water closet, sink, and shower are all located within the same room. From the beginning, the design focused on how shower water could splash around the space while keeping the necessary bathroom items dry. The solution was to use flush-mounted cabinets with upward opening stainless steel doors or slide-up mirrors. Even the toilet paper is kept dry with a measurable tip allowed to dispense from the bottom of the door. The floor is a high quality epoxy resin turned up the walls six inches to ensure a watertight fit. 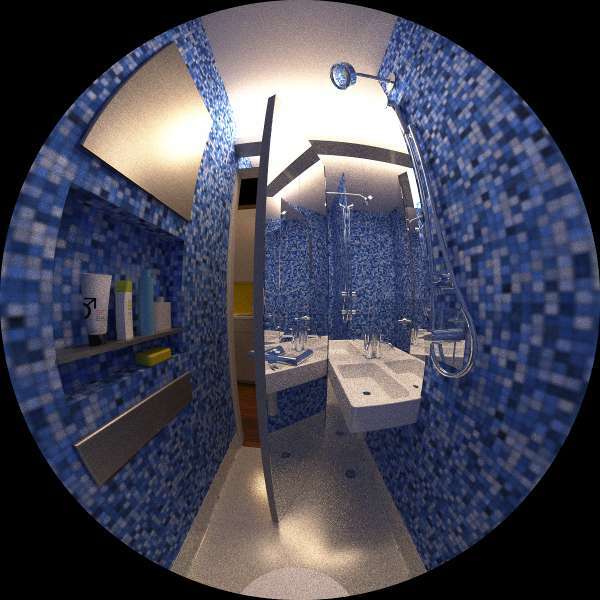 The walls are a colorful blue tile and the ceiling a waterproof epoxy. The sink is a side access porcelain model that clears behind the swing of the door, and under it, out of the way, is the shower drain. Mirrors line the wall of the door, the back of the door, and above the sink. This creates the illusion of a larger space and also bounces the light from the waterproof fixture around the room. A standard shower head is wall mounted along with a hand sprayer, but a ceiling mounted rain shower would have also been an interesting option. 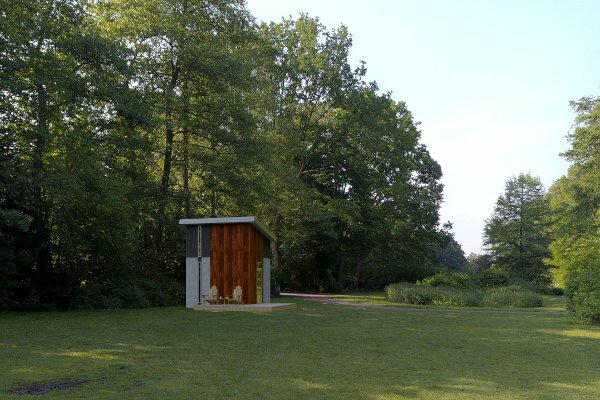 This toilet is a wall-hung model that uses a tank in the wall behind it to conserve space. Standard porcelain water closets are adapted to a wet room, but these are quickly disappearing in favor of more sophisticated technology. Especially from Japan, toilets now have more standard features than most Americans expect in a premium fixture! 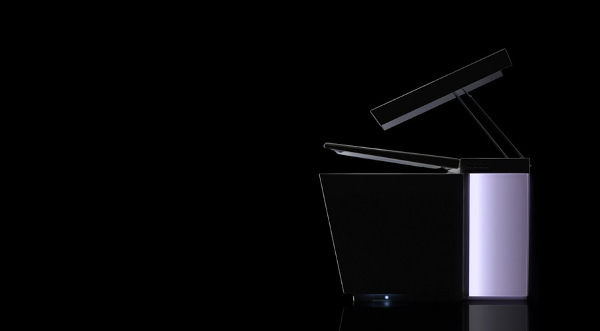 Kohler has recently stepped in to the competition with a, literally, “lights out” approach to feature offerings. Think you might want your toilet to have a motion activated seat, self-cleaning wand bidet function with multiple spray patterns and pressures, integrated air dryer, deodorizing charcoal filtered exhaust, heated seat, foot warming air jets, multi-color lighting for each day of the week, and music? Check out the Kohler Numi. At a corpulent list price of $5,987 (can be found for at least $1,000 less), it has a touch screen remote control tablet with user preferences for six users. I think I forgot to mention—it has a setting for an economical, low water use flush. We still have a few more articles to present the remaining ideas developed in the Reset House. I hope you can see how even a small space can be fully featured, comfortable, and even luxurious. The next article will present the kitchen design and appliances as well as some insights about selecting options based on the style of the chef. Continue to follow the articles here referencing the Reset House category to see the collection. Follow me on Facebook, Twitter, or Google+ to receive updates when new articles are posted. This entry was posted in Reset House on 2014-01-10 by Steve Hall.